Some of the biggest names in British film, television and theatre are warning that government cuts pose a serious threat to the arts in the UK. 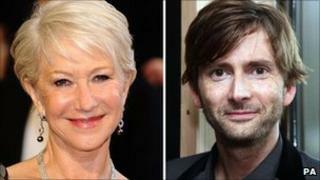 In a letter to the Observer, Dame Helen Mirren, David Tennant and others say public investment in the arts brings in a "staggering" return for the country. "Culture cannot and should not be an easy target for cuts," they add. Culture Secretary Jeremy Hunt said cuts to the arts were less deep than those to many other areas such as the police. In October, the government announced that Arts Council England - which distributes money to hundreds of arts venues, theatre groups and galleries - would have its budget cut by almost 30%. Since then a number of local councils have announced plans to slash their arts provision. The moves follow the scrapping of the UK Film Council, which counts Oscar-winning film The King's Speech among its projects. Among the signatories to the letter are comedians Miranda Hart, Rory Bremner and Jo Brand, and actors Simon Callow, Kenneth Branagh and Jeremy Irons. It states: "Before the last election the government promised to usher in a 'golden age' for the arts. "The reality couldn't be further from this... We are currently facing the biggest threat to funding the arts and culture have experienced in decades." The stars said public money was "critical for the UK's creative industries" and in return, the sector contributed more than £7bn a year to the economy. In a further statement, actress Julie Walters said: "Cutting off funding at a local level deprives a community of its cultural focus and future audiences from a generation of talent." Comic and writer Victoria Wood added: "Of course there have to be financial constraints, but let's not smack new writers in the face with the bill before they've got their feet under the table." The culture secretary said the stars were "right to have concerns about what is happening in some local areas". "I would urge local councils to recognise the huge economic importance of the arts, as well as the cultural and social importance," he said. "But at a national level... the actual net cut in arts funding is only 11% and that is a lot better than, for example, the police, or the Foreign Office, or many others areas. "So we are doing everything we can, precisely because we understand the economic importance of the arts and what they do for our national way of life." Mr Hunt was also asked about the Commons' Culture, Media and Sport Committee's decision to approve the appointment of former Hong Kong governor Lord Patten as the new chairman of the BBC Trust. The committee said in its report the former Conservative Party chairman was a "suitable candidate," but it was "surprised" that his "knowledge of the BBC's output on television and radio is limited". Lord Patten told the committee he was a fan of BBC4 and BBC2 television as well as Radio 3 and Radio 4, but when asked when he had last watched EastEnders, said: "I should think even longer ago than I last had a McDonald's." The culture secretary said he did not think Lord Patten's particular tastes should cause concern. "The BBC's historic role is to be the quality benchmark in British broadcasting... and I'm sure what he wants to make sure is that the BBC isn't involved in some sort of race to the bottom," he said.